Looks like I’ve accidentally created a series of articles here about fundamental numbers. I didn’t intend to; originally, I was just trying to write the zero article I’d promised back during the donorschoose drive. Anyway. Todays number is *e*, aka Euler’s constant, aka the natural log base. *e* is a very odd number, but very fundamental. It shows up constantly, in all sorts of strange places where you wouldn’t expect it. But that’s not a sufficient answer. We call it the *natural* logarithm. Why is that bizzare irrational number just a bit smaller than 2 3/4 *natural*? It’s also what you get if you take the limit: *lim*n → ∞ (1 + 1/n)n.
It’s also the base of a very strange equation: the derivative of *e*x is… *e*x. And of course, as I mentioned yesterday, it’s the number that makes the most amazing equation in mathematics work: *e*iπ=-1. Why does it come up so often? It’s really deeply fundamental. It’s tied to the fundamental structure of numbers. It really is a deeply *natural* number; it’s tied into the shape of a circle, to the basic 1/x curve. There are dozens of different ways of defining it, because it’s so deeply embedded in the structure of *everything*. This entry was posted in Numbers on August 2, 2006 by markcc. Lighter Topics – what do you want to know? The category theory series is finally winding down; I’ve got one topic I’d like to write about, and then I’ll have had my fill of category theory for a while. I don’t want to dive right in to another really deep topic like topology, so I’m looking for some subjects that people are interested in that can be covered in one or two posts. I could come up with some by myself (and probably will), but there are a lot of things like the zero article which so many people seemed to enjoy which I could write about, but probably wouldn’t think of on my own. So, what would you like to see one or two posts on? This entry was posted in Meta and tagged Meta on August 1, 2006 by markcc. After the amazing response to my post about zero, I thought I’d do one about something that’s fascinated me for a long time: the number *i*, the square root of -1. Where’d this strange thing come from? Is it real (not in the sense of real numbers, but in the sense of representing something *real* and meaningful)? The number *i* has its earliest roots in some of the work of early arabic mathematicians; the same people who really first understood the number 0. But they weren’t quite as good with *i* as they were with 0: they didn’t really get it. They had some concept of roots of a cubic equation, where sometimes the tricks for finding the roots of the equation *just didn’t work*. They knew there was something going on, some way that the equation needed to have roots, but just what that really mean, they didn’t get. Things stayed that way for quite a while. Various others, like the Greeks, encountered them in various ways when things didn’t work, but no one *really* grasped the idea that algebra required numbers that were more than just points on a one-dimensional number-line. The next step was in Italy, over 1000 years later. During the 16th century, people were searching for solutions to the cubic equations – the same thing that the arabic scholars were looking at. But getting some of the solutions – even solutions to equations with real roots – required playing with the square root of -1 along the way. It was first really described by Rafael Bombelli in the context of the solutions to the cubic; but Bombello didn’t really think that they were *real*, *meaningful* numbers: it was viewed as a useful artifact of the process of solving the equations, but it wasn’t accepted. It got its name as the *imaginary number* as a result of a diatribe by Rene Descartes, who believed it was a phony artifact of sloppy algebra. He did not accept that it had any meaning at all: thus it was an “imaginary” number. They finally came into wide acceptance as a result of the work of Euler in the 18th century. Euler was probably the first to really, fully comprehend the complex number system created by the existence of *i*. And working with that, he discovered one of the most fascinating and bizzare mathematical discoveries ever, known as *Euler’s equation*. I have no idea how many years it’s been since I was first exposed to this, and I *still* have a hard time wrapping my head around *why* it’s true. That’s just astonishing. The fact that there is *such* a close relationship between i, π, and e is just shocking to me. Once the reality of *i* as a number was accepted, mathematics was changed irrevocably. Instead of the numbers described by algebraic equations being points on a line, suddenly they become points *on a plane*. 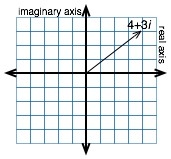 Numbers are really *two dimensional*; and just like the integer “1” is the unit distance on the axis of the “real” numbers, “i” is the unit distance on the axis of the “imaginary” numbers. As a result numbers *in general* become what we call *complex*: they have two components, defining their position relative to those two axes. We generally write them as “a + bi” where “a” is the real component, and “b” is the imaginary component. The addition of *i* and the resulting addition of complex numbers is a wonderful thing mathematically. 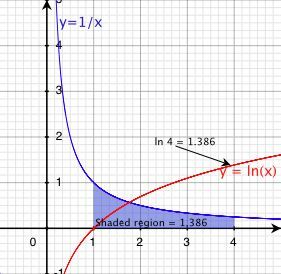 It means that *every* polynomial equation has roots; in particular, a polynomial equation in “x” with maximum exponent “n” will always have exactly “n” complex roots. But that’s just an effect of what’s really going on. The real numbers are *not* closed algebraically under multiplication and addition. With the addition of *i*, multiplicative algebra becomes closed: every operation, every expression in algebra becomes meaningful: nothing escapes the system of the complex numbers. Of course, it’s not all wonderful joy and happiness once we go from real to complex. Complex numbers aren’t ordered. There is no < comparison for complex numbers. The ability to do meaningful inequalities evaporates when complex numbers enter the system in a real way. But what do complex numbers *mean* in the real world? Do they really represent real phenomena? Or are they just a mathematical abstraction? They’re very real. There’s one standard example that everyone uses: and the reason that we all use it is because it’s such a perfect example. Take the electrical outlet that’s powering your computer. It’s providing alternating current. What does that mean? But that’s not really accurate. If you grabbed the wire when the voltage is supposedly zero on that graph, *you’d still get a shock*! Take the moment marked “t1” on the graph above. 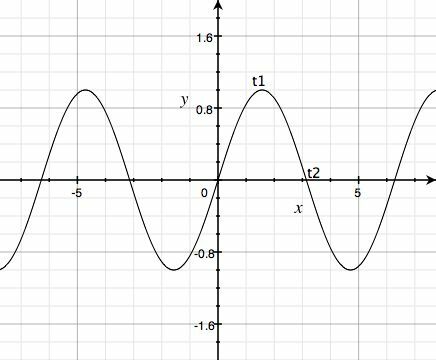 The voltage at time t1 on the complex plane is a point at “110” on the real axis. At time t2, the voltage on the “real” axis is zero – but on the imagine axis it’s 110. In fact, the *magnitude* of the voltage is *constant*: it’s always 110 volts. But the vector representing that voltage *is rotating* through the complex plane. do that decomposition is intimately tied with complex numbers: the fourier transform, and all of the analyses and transformations built on it are dependent on the reality of complex numbers (and in particular on the magnificent Euler’s equation up above). This entry was posted in goodmath on August 1, 2006 by markcc. While taking a break from some puzzling debugging, I decided to hit one of my favorite comedy sites, Answers in Genesis. I can pretty much always find something sufficiently stupid to amuse me on their site. Today, I came across a gem called [“Information, science and biology”][gitt], by the all too appropriately named “Werner Gitt”. It’s yet another attempt by a creationist twit to find some way to use information theory to prove that life must have been created by god. It looks like the Gitt hasn’t actually *read* any real information theory, but has rather just read Dembski’s wretched mischaracterizations, and then regurgitated and expanded upon them. Dembski was bad enough; building on an incomplete understand of Dembski’s misrepresentations and errors is just astonishing. Anyway, after butchering an introduction to Shannon theory, he moves onward. >statistical information density is 1.88 x 1021 bits/cm3. This is, of course, utter gibberish. DNA is *not* the “highest information density known”. In fact, the concept of *information density* is not well-defined *at all*. How do you compare the “information density” of a DNA molecule with the information density of an electromagnetic wave emitted by a pulsar? It’s meaningless to compare. But even if we accept information as only physically encoded, Consider the information density of a crystal, like a diamond. A diamond is an incredibly compact crystal of carbon atoms. There are no perfect diamonds: all crystals contain irregularities and impurities. Consider how dense the information of that crystal is: the position of every flaw, every impurity, the positions of the subset of carbon atoms in the crystal that are carbon-14 as opposed to carbon-12. Considerably denser than DNA, huh? After this is where it *really* starts to get silly. Our Gitt claims that Shannon theory is incomplete, because after all, it’s got a strictly *quantitative* measure of information: it doesn’t care about what the message *means*. So he sets out to “fix” that problem. He proposes five levels of information: statistics, syntax, semantics, pragmatics, and apobetics. He claims that Shannon theory (and in fact information theory *as a whole*) only concerns itself with the first; because it doesn’t differentiate between syntactically valid and invalid information. Let’s take a quick run through the five, before I start mocking them. 1. Statistics. This is what information theory refers to as information content, expressed in terms of an event sequence (as I said, he’s following Dembski); so we’re looking at a series of events, each of which is receiving a character of a message, and the information added by each event is how surprising that event was. That’s why he calls it statistical. 2. Syntax. The structure of the language encoded by the message. At this level, it is assumed that every message is written in a *code*; you can distinguish between “valid” and “invalid” messages by checking whether they are valid strings of characters for the given code. 3. Semantics. What the message *means*. 4. Pragmatics. The *primitive intention* of the transmitter of the message; the specific events/actions that the transmitter wanted to occur as a result of sending the message. 5. Apobetics: The *purpose* of the message. According to him, level 5 is the most important one. Throughout the article, he constantly writes “theorems”. He clearly doesn’t understand what the word “theorem” means, because these things are just statements that he would *like* to be true, but which are unproven, and often unprovable. A few examples? >must be strictly observed thereafter. >the information is to be understood. >condition for the existence of information. >concluded that the system originates from a mental concept. structured encoding is information. And this is also the absolute crux of his argument: information only exists as a part of a code *designed by an intelligent process*. Despite the fact that he claims to be completing Shannon theory, there is *nothing* to do with math in the rest of this article. It’s all words. Theorems like the ones quoted above, but becoming progressively more outrageous and unjustified. After this, we get to his conclusion, which is quite a prize. >concept of information have been defined in the form of theorems. See, to him, a theorem is nothing but a “form”: a syntactic structure. And this whole article, to him, is mathematically complete. >Creator, the great Logos Jesus Christ. That’s where he wanted to go all through this train-wreck. DNA is the highest-possible density information source. It’s a message originated by god, and transmitted by each generation to its children. And as usual for the twits (or Gitts) that write this stuff, they’re pretending to put together logical/scientific/mathematical arguments for god; but they can only do it by specifically including the necessity of god as a premise. In this case, he asserts that DNA is a message; and a message must have an intelligent agent creating it. Since living things cannot be the original creators of the message, since the DNA had to be created before us. Therefore there must be a god. This entry was posted in Debunking Creationism, information theory on July 31, 2006 by markcc. the multiplicative linear logic. Before we jump into that, I want to explain why it is that we separate out the multiplicative part. The main reason that people like me really care about linear logic is because there is a variant of lambda calculus that includes *linear types*. Linear types are types where referencing the value corresponding to the type *consumes* it. For dealing with the semantics of real programming languages, there are many things that make sense as linear types. For example, the values of an input stream behave in a linear way: read something from an input stream, and it’s not there anymore: unless you copied it, to put it someplace safe, it’s gone. For typing linear lambda calculus, we use *intuitionistic linear logic* with the *multiplicative* operators. They give us a *decidable* type system with the capability to express linear type constraints. Enough side-tracking; back to the categories. So, what does this mean? Take the linear implication operator; mix it with the categorical exponent; and what you get *still* behaves *linearly*: that is, if “X -o Y”; that is, one X can be consumed to produce one Y, then 2 Xs can be consumed to produce 2 Ys; and N Xs can be consumed to produce N Ys. So a linear category behaves cleanly with exponents; t has a linear implication; it has an *eval* operator (from the fact that it’s a cartesian category) to perform the linear implications; it has tensor for producing groups of resources. That’s it; that’s everything we need from categories for a model of linear logic. Now, there’s just one more question: are there any real linear categories that make sense as a model for linear logic? And obviously, the answer is yes. There are two of them, called **CPO** and **Lin**. **CPO** is the category with continuous partial orders as objects, and monotonic functions as morphisms. Think about that, and it makes a whole lot of sense for linear logic; the equivalence classes of the partial order are resources of the same “value” (that is, that can be exchanged for one another); and you can’t climb *upwards* in the partial order without adding something. The other one, **Lin**, is a lot more complicated. I’m not going to explain it in detail; that would lead into another two-month-long series! But to put it briefly, **Lin** is the category with *coherent domains* as objects, and linear maps as morphisms. To make that make sense, I would have to explain domain theory, which (to put it mildly) is complicated; the short version is that a domain is a kind of CPO. But the reason we care about **Lin** is that programming language semantics are generally described using [*denotational semantics*][denote]; and denotational semantics are built using a kind of domain, called a Scott domain. So this gives us a domain that we can use in programming language semantics with exactly the properties we need to explain how linear types work. This entry was posted in Category Theory, goodmath on July 31, 2006 by markcc. I was reading an article on Slashdot the other day about a recent discovery of what might be a MECO. A [MECO][wiki-meco] is a “magnetospheric eternally collapsing object”; if this were true, it would be a big deal because according to relativity, either black holes exist and MECOs don’t, or MECOs exist and black holes don’t. I have no intention of getting into the MECO vs. black hole argument. But a commenter there put down a link to something that he seemed to think was a [reasonable argument against relativity][nastytruth]. I took a look, and it’s just *hysterically* funny. The author of the site is a total crackpot; not only does he propose a way of totally redefining physics, but he also proposes an explanation for everything that’s wrong with modern software, and exactly how to build a real, proper AI. One of my mantras for dealing with crackpots is: “The very worst math is no math”. This guy does a spectacular job of demonstrating that. Just for fun, I’ve got to quote the beginning of his diatribe. There’s nothing more fun than watching a crackpot rant about how it’s the *rest* of the world that are crackpots. >concept of absolute motion to be no more credible than the flat earth. >does not matter whether there are only two bodies or a billion. >to believe in if we accept exclusive relativity. If you have two particles and nothing else, you can define their *positions* relative to each other in terms of their *distance* from each other. It’s not circular. Distance is the important fact. In a relativistic universe, there is no special *distinguished* reference point where the “real” position of objects is defined relative to that reference. Everything is described relative to *a* reference; but that reference can be pretty much any location you choose. This doesn’t mean that measurements or positions are meaningless. It just means that they’re *relative*. There’s actually a whole field of mathematics that studies things like this: it’s called metric topology. Speaking *very* loosely, metric topology looks at what kinds of *shapes* a continuous surface can take, and how to measure distance in those different kinds of spaces. For example, if we lived in a two dimensional world, we could imagine that the world was a flat plane. In that case, the distance between two points is defined in one way. And it doesn’t matter *where* you put your reference point on the plane; the distance between two objects on that surface will be the same. We could also imagine a two dimensional world that was the surface of a torus. The distance between objects would be rather different there; but still, you could measure the distance between two objects on the surface of the torus. And no matter what point of reference you choose, the torus looks the same. But if you’re a clueless twit who doesn’t understand what “relative position” means, then you can end up with the argument that this guy just presented. The problem with the author of this piece is that *he’s not doing math*. Relativity isn’t just a theory with a bunch of words that say “position is relative”, etc. It’s a set of mathematical equations that define in a very precise way what that means, and how it works. Like I said: the worst math is no math. If he’d tried to understand the math, he’d know that there’s no problem here. >it can use are absolute ones. Same exact problem as his “simple proof #2”. He didn’t do the math, and so he drew a really stupid invalid conclusion. The math of relativity explains how this works: the apparent velocity and acceleration of a particle in all frames of reference are equally valid; and the reason that they’re equally valid is because if you do the math for shifting the reference frame, you find that the different apparent values are really just different views of the same thing. This entry was posted in Bad Physics on July 29, 2006 by markcc. I was hoping for a bit of a vanity post for todays pathological programming language in honor of my 40th birthday (tomorrow), but I didn’t have time to finish implementing my own little piece of insanity. So it’ll have to wait for some other occasion. Todays pathological programming language is a really simple monstrosity called [“Whenever”][whenever]. Whenever is a programming language where programs get executed in *random* order, and there are *no* variables. The only state, the only way of manipulating information in a Whenever program is by manipulating the collection of executable statements itself: the program is both the code *and* the data at the same time. The basic program model of Wheneveris: you write a set of statements. The statements are inserted into a grab-bag by the interpreter. The interpreter then repeatedly picks a statement out of the bag *at random* and executes it. It keeps doing that until there are no more statements in the bag. Everything in Whenever is done by manipulating the statement bag. Each statement is labeled by a number. The number has no direct meaning; it’s just an identifier that will be used to reference the statement. The numbers assigned to lines don’t have to match the order in which the lines were written in the source file; and they have no effect on the order by which statements are pulled out of the bag. So how do you do anything in this crazy language? is the hello world program. Since there’s only one statement, it’ll get grabbed from the statement bag, and executed. There’s also a read statement, which reads a number from standard input, and then acts as if the statement were the number that it read. would print “Hello world” twice. If 23 were executed first, it would print “Hello world”, and then only 11 would be in the bag, so it would execute 11, which would add 23 to the bag. If 11 went first, then it would add 23 to the bag, and there would be two 23s in the bag, which would get executed. Would insert one copy of statement 21 and four copies of statement 3 to the bag; and remove one copy of statement 2, and two copies of statement 5. You can also do any normal arithmetic operation on numbers. The result of the arithmetic operation is interpreter as a line number. There’s also two kinds of conditionals, “defer” and “again”. Defer takes a parameter which is evaluated to a line number, and if there are any copies of that line number in the bag, then it reinserts itself, and doesn’t do anything else. If there are no copies of the parameter in the bag, then the statement on the rest of the line is executed. is a more complicated version of hello world. The “again” statement is very similar to the “defer” statement; but if its argument is true (i.e., evaluates to a statement that is present in the bag), then it adds a copy of itself to the bag; whether the parameter is true or false, it then executes the rest of the statement. There’s one helpful built-in function: N(x) returns the number of copies of statement x in the bag. This first ensures that statement four runs first: statements 1, 2, and 3 will all defer until 4 has been executed. Once four is run, there are 99 copies of statements 1, 2, and 3 in the bag. The rest of the defer statement makes sure that 1 executes before 2, and 2 before 3; so it cycles through 1, 2, 3 99 times. Pretty simple, right? If you look carefully.. It generates the first 100 fibonacci numbers. It's an incredibly simple language. Simple, but quite twisted, and seriously mind-warping to try to program: you need to always keep track of the fact that the statements that represent your data could get selected for execution, which will modify the data unless you used a "defer" as a guard, but then you need to make sure that the guard gets preserved correctly… It's quite devious. This entry was posted in pathological programming on July 28, 2006 by markcc. I’ve been taking a look at William Dembski’s paper, “[Information as a Measure of Variation][imv]”. It was recommended to me as a paper demonstrating Demsbki’s skill as a mathematician that isn’t aimed at evolution-bashing. I’m not going to go into too much detail about it; it’s just not that good. If this is the best work he’s done as a mathematician, well, that’s pretty sad. 3. Much of the paper is very unclear, even obfuscatory. The second two are typical of Dembski’s writing, and not particularly interesting. I’m going to focus on three egregious cases of misrepresentation. >Ordinarily, information refers to the meaning or semantic content of a message. >which the message is transmitted from sender to receiver. >The most common vehicle for transmitting messages is the character string. This is wrong, and it’s deliberately wrong. The reason it’s wrong? As I described in my [introduction to information theory][intro-it] (IT), there are two main branches of IT: Shannon and Kolmogorov-Chaitin. Demsbki is definitely aware of both; he references the work of Chaitin in papers written *before* this one. But in his description of information theory here, he focuses exclusively on Shannon theory, and presents it as if it were the entirety of mathematical IT. Why would he do that? Well, because it makes it easier to make his argument about why it makes sense to view information in terms of a series of events. Later in the paper, he’s going to argue that information entropy is the *wrong* measure for information; but that argument can *only* make sense in Shannon theory. And even for the Shannon IT that he uses, the way that he characterizes it is sloppy. Looking at this, it’s hard to tell if he just really *doesn’t get it*, or if he’s trying to slip something past the readers. It’s sufficiently messed up that it’s hard to determine exactly what he means. I can see two very different readings. 1. The two possibilities are, as he says, RF and ¬ RF. That is, we’re going to be told whether or not a hand is a royal flush. We are *not* going to be told what the cards in the hand are: we are simple going to get a yes/no answer to the question “Is the hand a royal flush?” If that’s the case, then this is completely wrong: being told “Yes, it’s an RF” gives you enough information to determine that the hand is one of four sets of cards: (the RF in each of the four suits); being told “No, it’s not an RF” is only enough information to determine that the hand is one of 52! – 4 possible sets of cards. And *in either case*, the information content is determined *not solely by the statement that the cards are, or are not, a royal flush*. The information content of those statements (per Kolmogorov-Chaitin, which is the kind of IT applicable to analyzing statements of this sort) is based on the statement *plus* the rules of poker that define the meaning of a royal flush. 2. We are told exactly what cards are in the hand. In that case, we know whether or not it’s a RF because we know what cards are there. In that case, whether you’ve got an RF or not, *you have a precise description of exactly one poker hand*. No matter what variant of IT you’re using; no matter whether you’ve got a flush or not; the amount of information that you have *is exactly the same*: it’s the identity of the 5 cards in your hand. >reference class of possibilities Ω…. Followed by an rather obfuscatory presentation of the equation for the Shannon IT entropy of an event sequence. So far, this part *could* be taken as just typical of Dembski’s dreadfully obscure writing style. But the next step he takes is where he’s deliberately being misleading. He asks why entropy rather than event probability is the preferred measure for information content? But he shifts the goalposts. Up until now, he’s been talking about mathematicians and IT theorists. Now suddenly, the question isn’t about why entropy is the preferred measure among *information theorists*; it’s why it’s the preferred measure among *communication theorists* (which are a different group of people); and the *answer* that he quotes is about *communication engineers*. So: again, he’s deliberately being misleading. He’s trying to convince you that you should think of information content in terms of probability. But instead of making that argument, he presents the definitions in a very strange way, and uses subtle unjustified changes to allow him to present the *weakest possible explanation* for why his preferred measure is not widely accepted. Dembski’s a damned lousy mathematician. Even when he isn’t trying to mislead people about evolution, he’s sloppy, obfuscatory, and prone to arguments based on strawmen. If this is an example of his best work as a mathematician, then someone really screwed up in giving him a PhD. This entry was posted in information theory on July 27, 2006 by markcc. In the comments on [my post mocking Granville Sewell’s dreadful article][sewell], one of the commenters asked me to write something about why evolution is frequently modeled as a search process: since there is no goal or objective in evolution, search seems like a strange approach. It’s a very good question, and so I’m going to do my best to give you a very good answer. As I’ve said before, math is all about *abstraction*: taking something, stripping it to its bare-bones essentials, and seeing what it means: for example category theory, which I’ve been writing about for the last month, is about taking the basic idea of a function as a thing that maps things to other things, and seeing what that means when it’s stripped of everything but the most basic properties of that notion of mapping. So when a mathematician looks at modeling evolution, the way that we approach it is to ask: What are the basic fundamental things that define the process of evolution? Evolution is a continual process in which those steps are repeated: you reproduce a pool of individual, either mutating while you copy, or copying then mutating. Then you select some subset of them as “winners” and keep them to copy for the next generation, and you discard the rest. What’s the selection criteria? From the starting point of a mathematical model, *it doesn’t matter*. What matters is that it’s a cyclic process of reproduction with mutation followed by selection. So we have a basic model. Now we look at it and ask: does this resemble any problem that I know how to solve? Let’s try drawing a picture of that: we’ll draw labelled dots for individuals; with arrows from a parent to a child. The children that were selected and reproduced, we’ll paint green; the children that were not selected we’ll mark red; and the current generation, which we haven’t selected yet, we’ll leave white. So, does this look familiar to a mathematician? Yes: it’s a mathematical structure called a graph. We know a lot about the mathematics of graphs. And evolution looks a lot like a process that’s building a graph. Each node in the graph is an individual; each edge in the graph is a reproduce with mutation step. 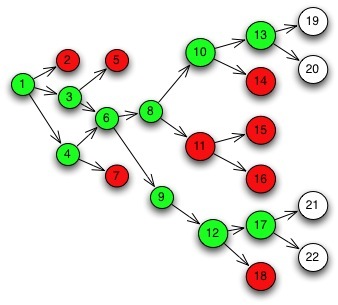 The leaf nodes of the graph are either successful individuals (in which case the graph is going to continue to grow from that leaf), or it’s an unsuccessful one, in which case that branch is dead. There are other possibilities for models of evolution; but the most obvious mathematical model for evolution is search: either a graph search or a terrain search, depending on exactly how you want to model the process of mutation. 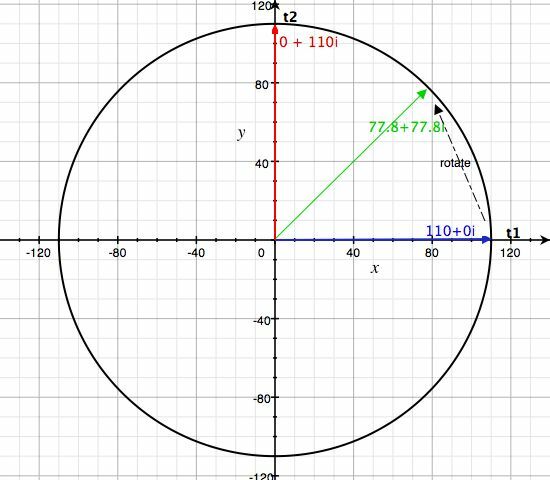 This entry was posted in goodmath on July 26, 2006 by markcc. Things are a bit busy at work on my real job lately, and I don’t have time to put together as detailed a post for today as I’d like. Frankly, looking at it, my cat theory post yesterday was half-baked at best; I should have held off until I could polish it a bit and make it more comprehensible. So I’m going to avoid that error today. Since we’ve had an interesting discussion focusing on the number zero, I thought it would be fun to show what zero means in category theory. There are two zeros it category theory: the zero object, and the zero arrow. The zero object is easier. Suppose we’ve got a category, C. Suppose that C has a *terminal object* – that is, an object t for which other object x in C has *exactly* *one* arrow f : x → t. And suppose that C also has an *initial object*: that is, an object i for which every object x in C has *exactly one* arrow, f : i → x. If C has both an initial object i, and a terminal object t, *and* i = t, then it’s a *zero object* for the category. A category can actually have *many* zero objects. For example, in the category of groups, any *trivial* group (that is, a group which contains only one element) is a zero object in the category of groups. For an intuition of why this is called “zero” think of the number zero. It’s a strange little number that sits dead in the middle of everything. It’s the central point on the complex plane, it’s the center of the number line. A zero *object* sits in the middle of a category: everything has exactly one arrow *to* it, and one arrow *from* it. A zero morphism in a category C is part of a set of arrows, called the *zero family* of morphisms of C, where composing *any* morphism with a member of the zero family results in a morphism in the zero family. To be precise: suppose we have a category C, and for any pair b of objects a and b ∈ Obj(C), there is a morphism 0a,b : a → . So – any zero arrow composed with an id arrow is a zero arrow. Now use induction to step up from ID arrows by looking at one arrow composed with an ID arrow and a zero arrow. You’ve still got a zero. Keep going – you’ll keep getting zeros. Zero arrows are actually very important buggers: the algebraic and topographical notions of a kernel can be defined in category theory using the zero morphisms. One last little note: in general, it looks like the zero objects and the zero morphisms are unrelated. They’re not. In fact, if you have a category with a zero object *and* a family of zero morphisms, then you can find the zero morphisms by using the zero object. For any objects a and b, 0a,b = (a → 0) º (0 → b). This entry was posted in Category Theory, goodmath on July 26, 2006 by markcc.